with hands-on analysis on the new Funky Color dials. Well known brand, and highly recognized. Highly recognized can also be a negative, as the watch is not for the understated. Overall package is quite nice. The combination of a serious diver watch with a chronograph function in a luxury package, might appeal to many. Not only those who intend to wear it on their luxury yacht, but also by those who do not own ships, but enjoy the robust, luxury nature of the watch. 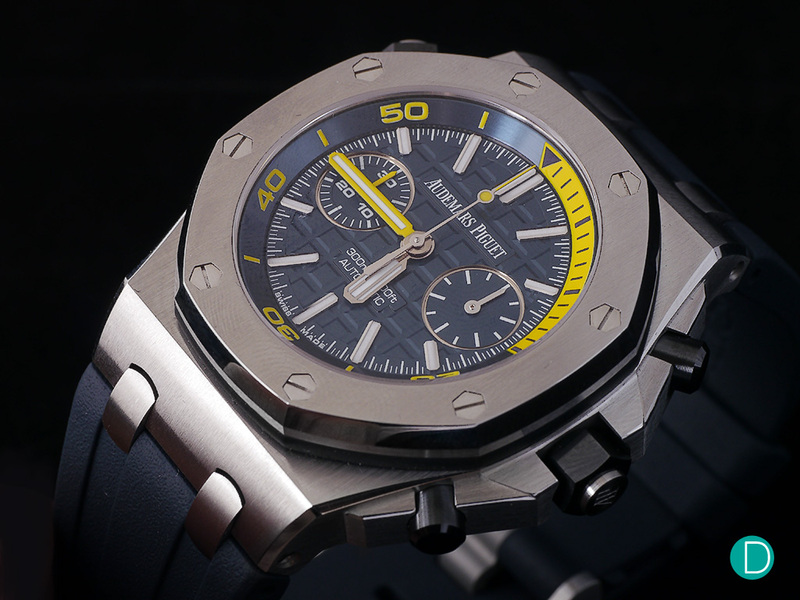 Audemars Piguet have had a great runaway success with their Royal Oak and Royal Oak Offshore series. It was not always a success. It took almost four years to sell the first 1000 RO, and when the ROO was announced in 1993, it was expected to fail. But Audemars Piguet was not to be denied. Both the RO and the ROO became great successes. And for 2016, we get the opportunity to have a hands-on review of the Audemars Piguet Royal Oak Offshore Diver Chronograph. The Royal Oak (RO) is an icon, designed by Gerald Genta, and released in 1972. Not only the design an icon, but the watch created a new genre in horology. The luxury steel watch market was born. The AP RO in 1972 carried a price tag of US$3,600, which was more than the price of a gold Patek Philippe Calatrava, and more than 8 times the price of the now iconic Rolex Daytona in steel. In 1972, steel watches were designed to be used and abused. Durability and practicality was an essential component in the design. The RO was conceived from the beginning to be an luxury item. It took a leaf from the world of haute horlogerie which of course AP was very familiar with, and applied it to a steel watch. Genius? Well, perhaps not thought to be so initially. The market reception was cool. Only 1000 pieces were sold from 72 to 76. Then the Quartz Crisis hit, and for some reason the RO became the poster boy for the non-quartz makers. AP, unlike many of its neighbors in the Jura, was saved from insolvency. And thrived. The RO saved the day. 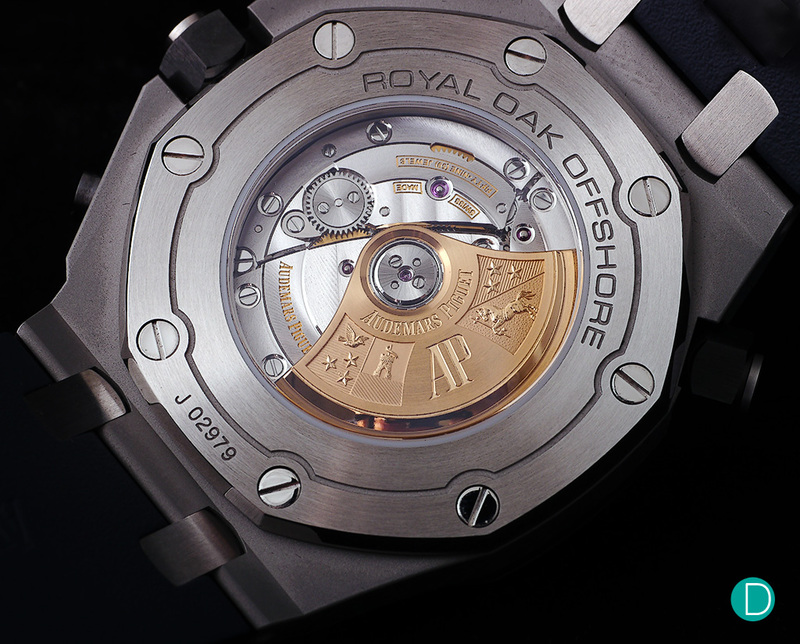 The Royal Oak Offshore (ROO) was created to mark the 20th anniversary of the Royal Oak. It was delayed and finally unveiled in Baselworld 1993. The design was undertaken by the then young, talented second generation designer working for AP Emmanuel Gueit (he was 22). AP’s CEO then was Stephen Urquhart, who then went on to run Omega and recently retired. Urquhart’s brief to Gueit was to make a RO for the young people. The design was unusual in those days. The case was large for its day at 42mm in diameter, and although it took cues from Genta’s work, it was quite different. The octagonal bezel was, perhaps the only strong linkage to Genta. The case was so massive that to fill the space from the selected JLC module chronograph movement (JLC base, Dubuis Depraz module), AP decided to use a soft iron core around the movement. This later became a selling point that the ROO was anti-magnetic. The links of the bracelet were curved, there was a massive visible black gasket on the bezel. The chronograph pushers and crown had silicon caps. And the stylized crown protection gave the case an even more massive feel, and it was nicknamed, “The Beast”. The initial shock and derision gave way to familiarity, and then all of a sudden, the ROO was the latest “It watch”. 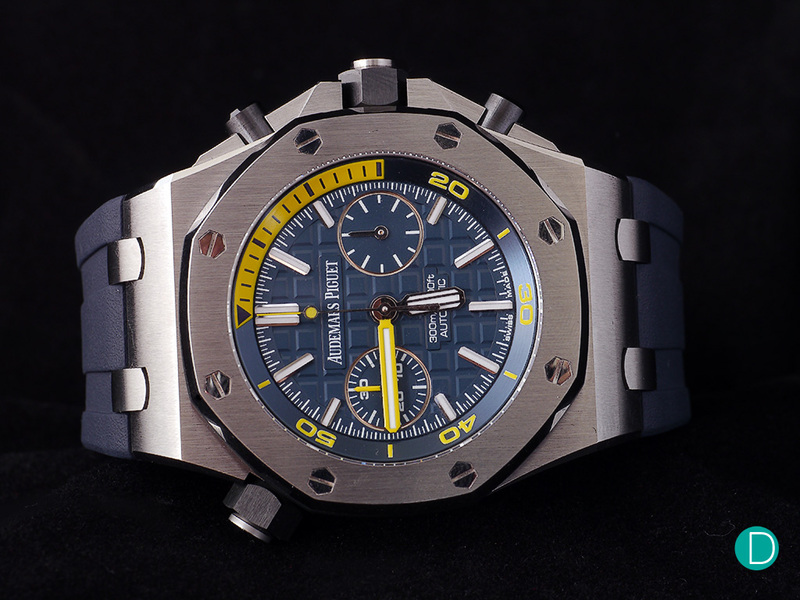 In 1997, AP released a wide range of new colors for the Offshore, to celebrate 25 years of the Royal Oak. This began what was to become the almost unlimited variations of limited editions for the Offshore. It was the very same year that Guiet conceived the first collaboration with a celebrity for a model – the Arnold Schwarzenegger’s End of Days. Interesting times. All four of the AP Royal Oak Offshore Diver Chronograph in funky color dials.AP Promotional photograph. The original Diver came about in 2006, and we wrote a comparison of the original Royal Oak Offshore Diver Steel version and the 2012 Forged Carbon version here. And for 2016, the range extends to include a chronograph in four versions with fancy colored dials: The Deep Blue limited to 400 pieces, the Lime Green limited to 50 pieces, the Tangerine Orange limited to 375 pieces and the Bright Yellow limited to 375 pieces. For this review, we chose to do the most understated model: the Deep Blue. The Audemars Piguet Royal Oak Offshore Diver Chronograph Deep Blue. The case remains the massive 42mm diameter/17.5mm thick one used in the regular ROO Diver. Even the black ceramic crowns are the same. Two additional ceramic pushers does duty for the chronograph. The iconic octagonal bezel with white gold hexagonal screws in their hexagonal countersinks has great presence. As with the other ROs and ROOs, the screws are not actually driven into the case from the bezel side, but fastened from the other side by tightening the corresponding nut. The case is rated to a depth rating of 300m, and is a serious dive watch with an ISO rating. The case is massive and has great presence. The dial is very legible. Note there are only two chronograph counters instead of 3 in the regular ROO Chronograph’s 12/9/6 layout. As with the ROO Diver, a crown at 10 o’clock operates the outer chapter ring which works as a dive bezel. Turning only in one direction so one can decrease the indicated dive time, but never increase it, it features a bright yellow section fron 0-15 marking the critical last 15 minutes of dive time. The Green and Orange versions have this section in the same green and orange as the dial and rubber strap, and the Yellow version is the same as the Blue with a yellow section. We note that some divers have commented that the location of the rotating bezel’s crown at 10 is awkward to use underwater. To reach it when the watch is worn on the left wrist requires a difficult twist of the right hand. This was observed in the original ROO Diver, and AP carried this arrangement over to this ROO Diver Chrongraph, and indeed some other dive watches like the Oris Great Barrier Reef LE 2 and the Omegas. We are not divers, but the question in our minds is why would a diver want to move the internal bezel, effectively reducing the planned dive time, while he is under water during the dive? The crown at 10 is easy to set on land or in the boat before the dive. It is then locked and left untouched so that it can warn the diver when he is approaching the limits. Audemars Piguet Royal Oak Offshore Diver Chronograph in Deep Blue. The dial is decorated with what AP calls the Mega Tapisserie pattern, basically large raised squares. The dial carries the same Mega Tapisserie pattern as the regular Diver. Interestingly due to the movement used, the AP 3124/3841, it features dual counters in a bi-compax arrangement. The earlier ROO Chronographs used a different Dubuis Depraz module, which have the typical 12/9/6 sub-dial arrangement. Dial legibility is excellent, as is expected of a serious dive watch. This dial layout is quite remarkable, as it does not add any additional clutter to the original Diver dial, while adding a very useful chronograph feature. The hands are the signature chunky Royal Oak hands which are huge, baton shaped, and filled with SuperLuminova. The center seconds hand carries a lolipop. The case exudes a nice luxury feel. As the watch is in stainless steel and quite generously proportioned, there is a substantial heft which can be felt on the wrist, but not one which is altogether unpleasant. Even after a period of acclimatization, one still feels it, is a rather nice and a quite desirable sensation. The movement is an in-house AP caliber 3124/3841 automatic chronograph movement. As with the double number nomenclature denoting that this is a module movement. The base is derived from the AP C.3120 which is in-house developed and manufactured. The AP C.3841 (which we understand is a derivative of the Dubuis Depraz module) chronograph module is then applied to the dial side. This movement is not new to AP, and we saw this fitted on the Audemars Piguet Jules Audemars Chronograph – a decidedly dressy, and very classy watch. The AP movement caliber 3124/3841 is visible from the back, and is based on the in-house caliber 3120 with a module chronograph. Examining the movement from the back, it is clear that the movement is rather small. It is 29.2mm in diameter and 7.16mm thick. On a case which is 42mm it is and looks small through the sapphire glass back. For some reason, this does not disturb us as much as a small movement in a dress watch, as the massive case surrounding the movement gives the impression of robustness and strength. Qualities treasured in a sports watch. The 22ct gold rotor is beautifully engraved with the coats of arms for the Audemars and Piguet families, all done with immaculate attention to detail. To the left of the AP engraving on the rotor, we find the Audemars family coat of arms featuring a bird, three stars and a donjon with a flag. And to the right of the AP engraving on the rotor, we find the Piguet family coat of arms featuring a horse holding a sword and three stars. The engraving is very detailed. For example, the horse’s muzzle to the mane and even the tail have been well executed. The movement is decorated with Côtes de Genève on all bridges, and anglage is applied. Only the base movement is visible from the case back. The chronograph module is under the dial, and not visible. The small movement is quite robustly constructed. It features a well designed balance bridge. Perhaps a diver chronograph in the luxury space is a small landscape. We suggest perhaps two possibilities. Rolex Cosmograph Daytona Ref. 116500 (CHF 11,800 which translates to approximately S$ 17,800 with GST in stainless steel with bracelet) is perhaps an obvious choice. It is only rated to a 100m depth. The Rolex C.4130 movement is perhaps as rugged and robust, and is also in-house manufactured. But it is arguably more advanced as it is an integrated, column wheel movement. 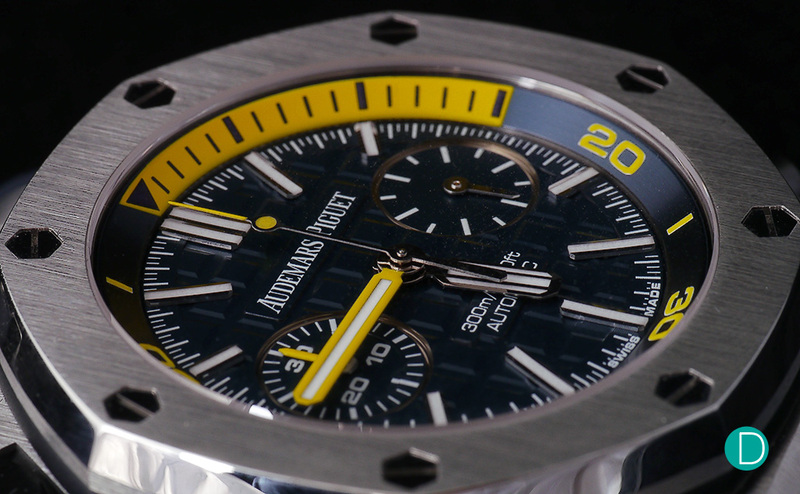 But the finishing nod should go to AP, as the ROO Diver Chronograph is finished to haute horgerie levels. And with it the Daytona aura, perhaps one to challenge even the mystique around the RO. Perhaps the more direct competitor might be the Vacheron Constantin Overseas Chronograph 5500 (S$44,500 with GST in steel). It features an in-house integrated column wheel chronograph and is rated to 150m. The VC is perhaps better finished, and features the brilliant 3 in 1 bracelet/strap system which is user exchangable, and included in the price. We might also consider the Patek Philippe Nautilus Chronograph Ref. 5980, but that is not available in steel. The closest steel version is the Patek Philippe Ref.5990 (S$70,500 incl GST in steel with steel bracelet) which carries also a date and dual time function. It too, is an integrated column wheel chronograph, and the chronograph has a flyback feature. The depth rating is only 120m, but the Patek has perhaps better finishing on both the case and movement. Again not a useful comparison. However, none of the competitors are apple to apple comparisons. 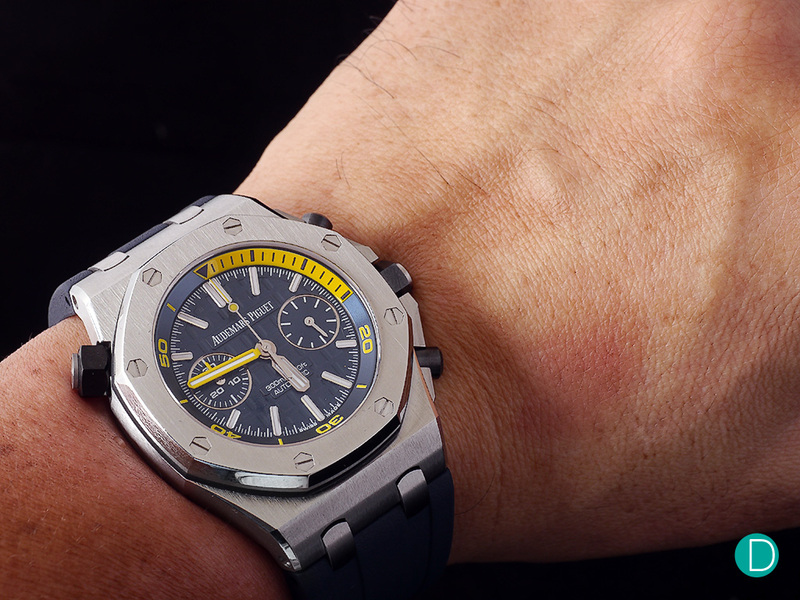 None have the same depth rating as the AP ROO Diver Chronograph. None are ISO certified for diving. Though the VC and PP carry the rugged steel case with a luxury finish concept of the genre, neither can claim lineage to its origin that the AP can. We find the Audemars Piguet Royal Oak Offshore Diver Chronograph to be quite well balanced in design and on the wrist. The Royal Oak Offshore Diver base is now extended with a very useful chronograph function, which can be operated to full depth rating. And the entire package is no more cluttered than the regular Diver. On the wrist the 42mm feels hefty, but relatively comfortable. It should go well with a sporty outfit as it is designed to do, rather to lie below a bespoke shirt cuff with a suit. This is a serious dive watch, which at the same time is a luxury item. Over the years, we have come to be a bit bored with the almost unending stream of Royal Oak Offshore limited editions. And frankly, we lost count. Don’t blame us, we think most collectors, except the most devoted Royal Oak specialist collectors would be in a similar position. But we still feel the ROO Diver Chronograph deserves serious consideration. We particularly liked the more discrete and reserved Deep Blue version. Though the other fancy colors strike us as a bit loud, we can imagine taming it with a black or blue or grey strap. We can even imagine, say the Bright Yellow on a yellow camo NATO strap. Would look cool. But we digress. The ROO Diver Chrono is definitely worthy of consideration. It is priced at S$31,900, though is high, but not excessive. It still is a member of the Royal Oak family and carries the heritage and an impeccable lineage to its predecessor, the Royal Oak of 1972. It is well designed and robustly built. It reeks luxury, and commands presence.